TIC Pt. 1 is the first installment of a series of games from Red Candy Games. You play as a robot trying to keep EvilCorp from stealing the oil from your home planet. The mechanics and controls for this game are incredibly simple and intuitive. You move, fly and drill your way through the planet in order to find and destroy machinery that is depleting your homeland. Collecting different acorns will enhance your abilities and unlock challenges while you journey through each level. The looks and sound of this XBLIG are far beyond the majority of its competitors. This game literally looks better that half the XBLA games available and at only 240MSP, you would be doing yourself a disservice not to check this game out. For a more in-depth look at the game, be sure to check out our review. 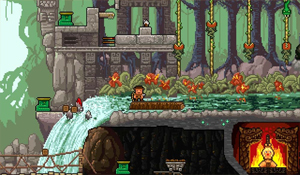 Platformance: Temple Death is an ode to the classic platformer games that we all grew up playing. This game is as simple as they come. One joystick moves your character and one button makes him jump. Your goal is to reach the end of a maze/gauntlet with a minimal amount of deaths. But there is no set number of lives, instead you can die as much as you would like. 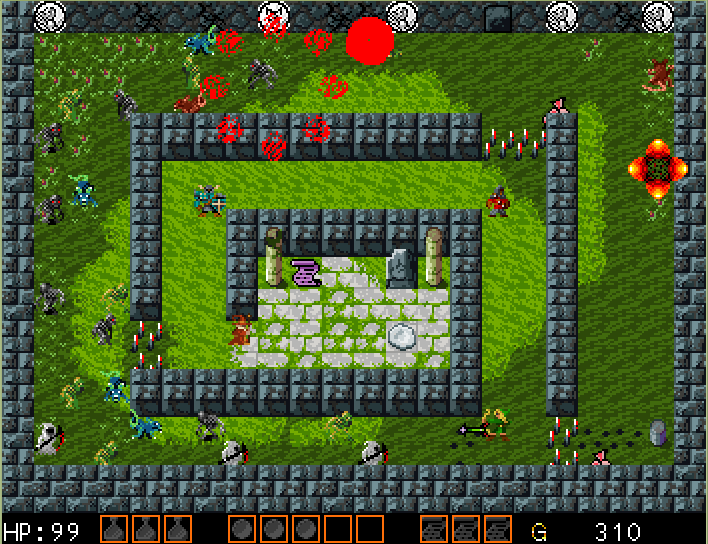 A checkpoint is available after every few obstacles making this game manageable for gamers of any skill level. 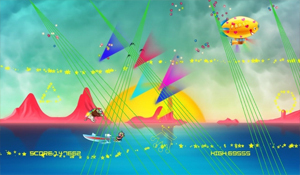 Three difficulty levels are included that each add a few more traps and obstacles to your journey. For only a dollar, this is an XBLIG that you simply can’t pass up. Techno Kitten Adventure! 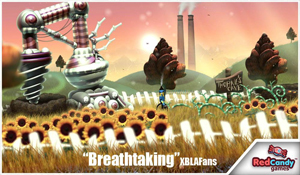 is possibly the craziest game available on the XBLIG marketplace. You play a kitten with a jetpack that flies through a moving dream world trying to avoid formations made out of shiny stars. One button is all you use to control the position of your kitten and you simply last as long as you can without hitting an obstacle to set high scores. The amount of things flashing on the screen can be overwhelming at times making Techno Kitten Adventure! an incredibly intense experience. But if you’re able to handle all of that, you experience parts that fall later in each music track where bass triggers, controller rumbles and flashing lights to add to the insanity. Sure the premise is as ridiculous as they come but the gameplay is simple fun and it’s hard not to become addicted to besting your high score. The Great Paper Adventure is a side scrolling schmup with all hand drawn characters and environments. The gameplay and formations are simple and easy to navigate making this more casual but it still manages to come across as such a unique schmup that even veteran gamers will be easily entertained. 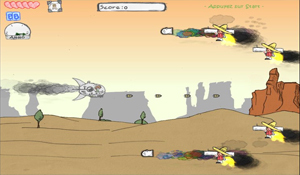 The enemies and boss battles are like nothing you’ve seen before in any schmup showing a great sense of creativity. The soundtrack is an amazing collection of chiptunes that will provide a sense of nostalgia for older gamers. 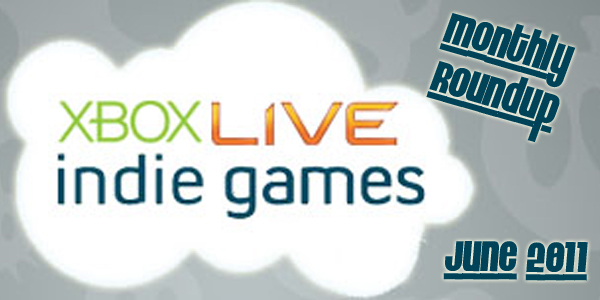 For only 240MSP, The Great Paper Adventure is a great experience for any gamer. Sum Fighter is a game very similar to Tetris Attack. You control one of six different characters that resemble a classic high school student stereotype as you match number blocks to clear your area of the screen. The more blocks you remove from your board, the more power ups you earn and the more random blocks you drop on your opponent’s board. The blocks all match up and disappear by adding the numeric values written on adjacent blocks. It sounds complicated but it’s incredibly easy to understand once you actually enter your first math battle. Each character has their own story line each with their own unique voice acting that is spot on. That’s a rare feature for most Indie games and it easily makes this puzzle battler worth the extra few dollars. If you are a fan of local competitive gaming, then you won’t want to pass this gem up.